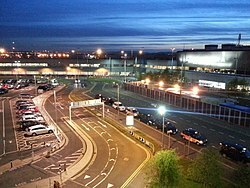 Edinburgh Airport (Scots: Edinburgh Airport, Scottish Gaelic: Port-adhair Dhùn Èideann) (IATA: EDI, ICAO: EGPH) is an airport located in the Ingliston area of the City of Edinburgh, United Kingdom. It was the busiest airport in Scotland in 2018, handling over 14.3 million passengers in that year, an increase of 6.5% compared with 2017. It was also the sixth-busiest airport in the United Kingdom by total passengers in 2018. It is located 5 NM (9.3 km; 5.8 mi) west of the city centre, just off the M8 and M9 motorways. It is owned and operated by Global Infrastructure Partners, who are also the majority shareholder and lead the management of Gatwick Airport. The airport has one runway and one passenger terminal, and employs about 2,500 people. Turnhouse Aerodrome was the most northerly British air defence base in World War I used by the Royal Flying Corps. The small base opened in 1916 and it was used to house the 603 (City of Edinburgh) Squadron from 1925, which consisted of DH 9As, Westland Wapitis, Hawker Harts, and Hawker Hind light bombers. All the aircraft used a grass air strip. In 1918 the Royal Air Force was formed and the airfield was named RAF Turnhouse and ownership transferred to the Ministry of Defence. When the Second World War broke out, RAF Fighter Command took control over the airfield and a runway of 3,900 ft (1,189 m) was paved to handle the Supermarine Spitfire. During the Battle of Britain, 3, 65, and 141 Squadrons were present at the airbase. When the war ended the airfield remained under military control, but by the late 1940s the first commercial services were launched. In 1947, British European Airways started a service between Edinburgh and London using Vickers Vikings followed by the Viscount and Vanguard series. In 1952 the runway was extended to 6000 ft to handle the Vampire FB5s operated by the resident 603 Squadron; and an aircraft carrier Catcher Net (never used) was installed to protect traffic on the adjacent A9 road. In 1956 a new passenger terminal was built to provide an improved commercial service; five years later it was extended. After the disbandment of 603 Squadron in March 1957, the Ministry of Defence transferred ownership to the Ministry of Aviation in 1960 to offer improved commercial service to the airport. Flying was temporarily diverted to East Fortune, which had its runway extended to accommodate the airliners of the period. The British Airports Authority took over ownership of the airport on 1 April 1971 at a time when the original terminal building was running at about eight times its design capacity. Immediate improvements to the terminal were cosmetic, such as extra seating and TV monitors for flight information, and it took two years for plans to be proposed for a completely new terminal and runway redesign. A public consultation on planning started in November 1971 and ended in February 1972. Initial stages of the redevelopment began in June 1973; they included a diversion of the River Almond. Work on the new terminal building, designed by Sir Robert Matthew, started in March 1975, and the building was officially opened by Her Majesty the Queen on 27 May 1977, opening to the public two days later. Although the original main runway 13/31 (which is now 12/30) served the airport well, its alignment (NW-SE) had the disadvantage of suffering from severe crosswinds, and the other two minor runways were very short and could not be readily extended, so movements were transferred to a new runway (07/25, which has since become 06/24) in an addition completely outside the original airfield boundary. This runway, completed in 1977, is 2,556 m (8,386 ft) in length, and was able to take all modern airliners including Concorde. A new terminal was built alongside the runway to cater for the additional traffic. The old terminal and hangars were converted into a cargo centre. International service from Edinburgh began in 1962 with a direct service to Dublin, but for many years international flights were charter and private only. This started to change during the late 1970s, with direct services to continental Europe (Amsterdam, 1975). By the mid-1980s direct routes included Paris, Düsseldorf, Brussels, Frankfurt and Copenhagen, but direct transatlantic flights were not yet possible as Prestwick was the only "designated gateway" in Scotland under the US-UK Bermuda II Agreement. By the time BAA had been privatised in 1987, Edinburgh Airport handled over 1.8 million passengers each year; compared to the 681,000 passengers handled in 1971 when BAA first took control of the airport. RAF Turnhouse was operational near the passenger terminal of the airport for all of the post war period, but was finally closed in 1997. Since the original terminal upgrade in 1977, there have been major reconstructions, including extensions of the two passenger terminal aprons and a major expansion of car parking facilities, including a multi-storey car park in 2004. In 2005, a new 57-metre-tall (187 ft) air traffic control tower was completed at a cost of £10m. An extension to the terminal called the South East Pier opened in September 2006. This extension initially added six gates on a new pier to the south-east of the original building. A further four gates were added to the South East Pier at the end of 2008. On 19 October 2011, BAA Limited announced its intention to sell the airport, following a decision by the UK's Competition Commission requiring BAA to sell either Glasgow Airport or Edinburgh Airport. BAA announced on 23 April 2012 that it had sold Edinburgh Airport to Global Infrastructure Partners for a price of £807.2 million. In 2013, a further extension to the passenger terminal was announced, taking the terminal building up to the Edinburgh Airport tram stop. The opening of the Edinburgh Trams in May 2014 created the first rail connection to Edinburgh Airport. Whilst the number of passengers has increased, the number of flights actually decreased in 2014 due to planes operating at higher capacity. Passenger traffic at Edinburgh Airport reached a record level in 2015 with over 11.1 million passengers and over 109,000 aircraft movements. The terminal building is currently[when?] being expanded with an investment of £40m. A new £25m expansion project involving the construction of a new 6,000m² building, housing a security hall and retail areas, is also currently[when?] under way at the airport. On 23 February 2016, Ryanair announced a growth of 20% in passenger numbers, bringing the airline's annual passenger capacity at Edinburgh Airport to 2.5 million. This was coupled with the news of six new services to Ryanair's winter schedule from Edinburgh, in addition to more services on its popular European destinations. In February 2016, consultancy firm Biggar Economics announced that Edinburgh Airport contributes almost £1 billion to the Scottish economy every year. As part of the expansion works, Runway 12/30 was officially withdrawn from use on 29 March 2018. Source: These statistics are combined BAA and CAA figures pre-1996, Edinburgh Airport: A History; McCloskey, Keith. Post 1996: United Kingdom Civil Aviation Authority. Airlink 100 - Express bus to and from the city centre. Skylink 200 - Local connections between Edinburgh Airport and North Edinburgh. Skylink 300 - Local connections between Edinburgh Airport and Cameron Toll. Skylink 400 - Local connections between airport and Fort Kinnaird. N22 - Night bus service to the city centre and Leith. 600 - Connections between Edinburgh Airport to Livingston via West Lothian towns. JET 747 - Connections between Edinburgh Airport with several park and ride facilities, Inverkeithing railway station and Dunfermline. Citylink Air - Express bus to and from Edinburgh Airport with Glasgow city centre. Citylink 909 - Express bus between Stirling and the airport. The airport lies on the A8 road, and can be reached by the M8 motorway and the M9 motorway. The airport is also within access from the M90 motorway via the Queensferry Crossing. The airport has no dedicated railway station. However, it is served by the nearby Edinburgh Gateway station, which serves as an interchange with Edinburgh Trams services to the airport. The tram line also connects the airport to the nearby Edinburgh Park railway station. A more expensive Edinburgh Airport Rail Link project to provide a direct heavy rail link was cancelled in 2007 due to increasing costs. The airport is served by Edinburgh Trams, a light rail link. The system runs from the airport and travels across the western suburbs of Edinburgh, terminating in the city centre. On 27 February 2001, a Loganair Shorts 360 (G-BNMT) operating a Royal Mail flight to Belfast, crashed into the Firth of Forth shortly after taking off from Edinburgh at 1730 GMT. Both crew members were killed, but there were no passengers on board. A fatal accident inquiry later blamed a buildup of slush in the aircraft's engines before the crash. A protective covering had not been fitted to the engine intakes while the aircraft was parked at Edinburgh for several hours in heavy snow. ^ a b "NATS – AIS – Home". Ead-it.com. Archived from the original on 17 October 2015. Retrieved 10 April 2019. ^ a b "Aircraft and passenger traffic data from UK airports". UK Civil Aviation Authority. 3 March 2017. Archived from the original on 11 February 2017. Retrieved 18 March 2018. ^ "Airport data 2018 - UK Civil Aviation Authority". www.caa.co.uk. Archived from the original on 29 March 2019. Retrieved 20 March 2019. ^ "Global Infrastructure Partners". Global-infra.com. Archived from the original on 10 March 2017. Retrieved 10 February 2017. ^ "EDI Facts and figures". '"Edinburgh Airport. Archived from the original on 1 June 2016. Retrieved 1 June 2016. ^ "Queen will be first to use air terminal". The Glasgow Herald. 27 May 1977. Retrieved 26 November 2017. ^ "Bermuda II, Full Agreement in PDF" (PDF). ^ "Site Record for Edinburgh, RAF Turnhouse". Canmore. RCAHMS. Archived from the original on 2 October 2013. Retrieved 8 January 2013. ^ "Heathrow: About us – Heathrow". Baa.com. Archived from the original on 4 February 2012. Retrieved 20 October 2011. ^ Heathrow. "Press Releases". Baa.com. Archived from the original on 11 May 2012. Retrieved 23 April 2012. ^ "Edinburgh Airport hails record year". BBC News. 11 January 2016. Archived from the original on 24 November 2018. Retrieved 21 June 2018. ^ "Edinburgh Airport Brings in the Bucks". Airport Parking Market. 26 April 2016. Archived from the original on 13 May 2016. Retrieved 26 April 2016. ^ "Flight timetables - Edinburgh Airport". www.edinburghairport.com. Archived from the original on 11 March 2018. Retrieved 9 April 2019. ^ a b "Alitalia to launch Edinburgh service". Business Traveller. Archived from the original on 2 March 2019. Retrieved 20 March 2019. ^ "American Airlines Expands European Footprint and Modifies Asia Service". news.aa.com. Archived from the original on 22 August 2018. Retrieved 21 August 2018. ^ "Delta continues international growth in Boston with new nonstop flights to Scotland". Delta News Hub. Archived from the original on 18 November 2018. Retrieved 9 November 2018. ^ Mitchell, Hilary (19 March 2019). "All about Aalborg - the cool new city you can fly to from Edinburgh Airport". edinburghlive. Archived from the original on 27 March 2019. Retrieved 20 March 2019. ^ a b "Lucky 7 for Scotland". Jet2.com. Archived from the original on 12 June 2018. Retrieved 5 April 2018. ^ "Flight Timetables - Jet2.com". Jet2.com. Archived from the original on 20 September 2017. Retrieved 24 April 2018. ^ "New Edinburgh to Vienna air link announced". 25 March 2019. Archived from the original on 27 March 2019. Retrieved 25 March 2019 – via www.bbc.co.uk. ^ "New Routes From Edinburgh". Loganair.co.uk. Archived from the original on 21 November 2018. Retrieved 3 November 2018. ^ "Airport Data 2018". UK Civil Aviation Authority. 9 March 2019. Tables 12.1(XLS) and 12.2 (XLS). Archived from the original on 6 March 2019. Retrieved 8 March 2019. ^ "Airport Services - Lothian Buses". Lothian Buses. Archived from the original on 26 October 2017. Retrieved 25 October 2017. ^ "21A - Edinburgh Airport - South East and Central Scotland - First UK Bus". First UK Bus. ^ "JET 747 Edinburgh Airport Bus - Stagecoach". Stagecoachbus.com. Archived from the original on 12 December 2017. Retrieved 11 December 2017. ^ "Citylink :: Connecting Scotland". Citylink.co.uk. Archived from the original on 12 December 2017. Retrieved 11 December 2017. ^ "New Edinburgh Gateway interchange opens in capital". Archived from the original on 13 December 2016. Retrieved 17 December 2016. ^ "Trains". Edinburgh Airport. Archived from the original on 10 August 2017. Retrieved 9 August 2017. ^ "MSPs back new airport rail link". 14 March 2007. Archived from the original on 1 April 2019. Retrieved 1 April 2019 – via news.bbc.co.uk. ^ "Edinburgh's trams roll into action". BBC News. Archived from the original on 19 October 2018. Retrieved 21 June 2018. ^ "Route map". Edinburgh Trams. 2009. Archived from the original on 18 September 2009. Retrieved 20 January 2010. ^ Harro Ranter (27 February 2001). "ASN Aircraft accident Shorts 360-100 G-BNMT Granton Harbour". Aviation-safety.net. Archived from the original on 14 May 2011. Retrieved 5 March 2009.